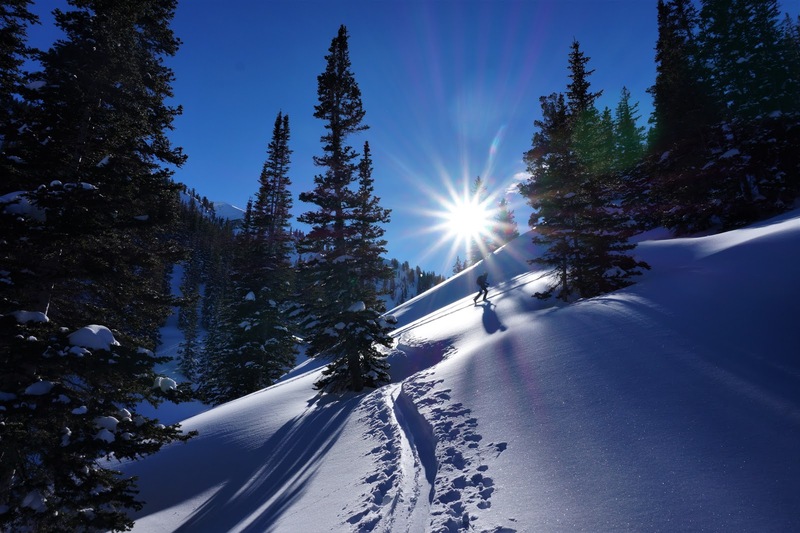 wasatch and beyond: What a day! What a weekend! What a week! What a LIFE! What a day! What a weekend! What a week! What a LIFE! As I sit here on Sunday night and try to think of a stretch where I've had this many consecutive amazing powder days in a row... I can't. The Wasatch has been going off in 2017 (and December was awesome too). Starting on New Year's Day, a legit storm cycle (~10 feet in 10 days measured in upper BCC) has made the snowpack deeper than it has been in a long time. It's feeling like 2010-2011, let's just hope the hose stays on like it did that season. Andrea and I got out on Wednesday, Thursday, and Friday (actually that was a solo day for me) mornings in Mill D. We have skied a lot in Mill D this year so far - its a great place for mid-elevation powder skiing when the avalanche danger is elevated. Ripping through aspen trees on a storm day doesn't really ever get old. With neither one of us running as much as in years past, we are now really able to take advantage of these sublime ski conditions and crank out some amazing days in our home mountains. These days all kind of blend together. Early starts, skiing the first run or two by headlamp, and trying to get in 5-7K of powder while still getting to work at a reasonable time in the morning. Mission accomplished! Andrea had to be done by 7:45am so we started early from Alta under a just-past-full moon, skiing the first lap off Flagstaff by moonlight, then the second lap as the sun peaked over the horizon. Solo the rest of the day, I couldn't get enough turns and ended up skiing the most I ever have in a day (and pretty much all untouched snow) after Andrea left before finally deciding to call it a day and beat the resort traffic down the canyon. I skied a bunch of south facing lines in upper LCC until the snow started to get damp, then did a few laps in the shade in Days Fork. Those last couple runs were amazing and I decided we'd head back to Days on Sunday. Storm skiing blower powder is great, but I don't think anything beats a bluebird powder day when the snow is still in great condition. After four straight dawn patrols we slept in and got a casual 8am start from Alta, heading straight to Days Fork and dropping in Jaws, a run I looked at yesterday but didn't want to ski solo with the giant cornice overhanging. It was so good, and I was a little worried the first run of the day would be the best. Nope! We spent the rest of the day skiing cold powder in Main and Banana Days. Everyone says the Wasangles is too crowded, but we were able to ski untouched snow all day, on a holiday weekend, in an area everyone knows about. Yuck. Everyone should move to Colorado or California. It was definitely a good weekend to be out of the valley and be skiing all day! Where did that come from?!?!? !